Trust is a key pillar of the financial and economic system overall. It is clear that when fraud occurs, this is extremely damaging to firms, shareholders, employees, and all other stakeholders. But seemingly contradictory observations can be made regarding the prevalence and drivers of managerial honesty. On the one hand, from the Enron scandal to the subprime crisis to the Bernie Madoff scam, corporate fraud and managerial misconduct have rattled shareholder value and investors’ trust over recent decades. Some research argues that one out of seven large corporations commits fraud every year, though only the tip of the iceberg is detected (Dyck et al. 2014). Dishonesty breeds distrust – which is particularly important for banks because their business model depends so much on trust. It was therefore doubly striking when the President of the American Finance Association, Luigi Zingales, noted in his Presidential Address (Zingales 2015), “I fear that in the financial sector fraud has become a feature and not a bug”. Moreover, contrasting doctors and financial service providers, he argued that “customers [of financial service institutions] are often not seen as people to respect, but as counterparties to take to the cleaners”. On a more positive note, substantial honesty even in the face of incentives to the contrary can be observed in real life. Most firms and managers do remain honest. Some individuals clearly give up gains that could be realised from misreporting. Whistleblowers and journalists risk their careers and sometimes their lives for bringing out the truth. Seeking to explain this wide variation in human behaviour, fundamental research increasingly shows that people differ in their intrinsic preferences for honesty and in their lying costs. Research suggests that people differ in the extent to which they regard honesty as a ‘protected value’ – that is, as a value for which they are willing to pay a price to uphold (Gibson et al. 2013). In short, not only the what, but also the how,matters to people. While these fundamental insights are interesting, from an applied perspective, the question is whether investors – and financial service institutions – can use insights regarding the drivers of behaviour to develop more suitable investment strategies and investment products. Also, is further regulation required to improve ethical management and promote honest corporate cultures? Or, can investors influence managers by making investment decisions based on perceived managerial honesty? Our new research in Gibson et al. (2018) sheds light on these questions and suggests great opportunities, but also some challenges for investors and companies. We investigate whether investors form views about a CEO’s honesty based on the that CEO’s previous actions – and whether this affects investment decisions. To be concrete, we consider a situation where investors see two CEOs (A and B), one who legally managed earnings to meet market expectations in the past, and one who did not do so. Consequently, CEO A, who announced the earnings that the market expected received a higher bonus than the other. The investors also learn the returns the two CEOs claim to make in the future. In some situations, CEO A claims higher returns – in others CEO B claims higher returns. We find three sets of striking results. First, although only legally acceptable practices of earnings management are considered, investors view CEO B, who has resisted the temptation to manage earnings in the presence of monetary incentives to do so, as substantially more honest on average than CEO A. But there is great variation in the assessment of CEO A’s and CEO B’s honesty by investors, suggesting that matters such as earnings management are not easy to assess by investors, and also that investors do have different views on this matter. Second, 60% of the participants in the experiment chose to invest with CEOs who did not engage in upwards earnings management and thus passed on the opportunity to earn a higher bonus. Strikingly, participants favoured CEOs they perceived to be more committed to honesty, even if this implied lower promised returns. 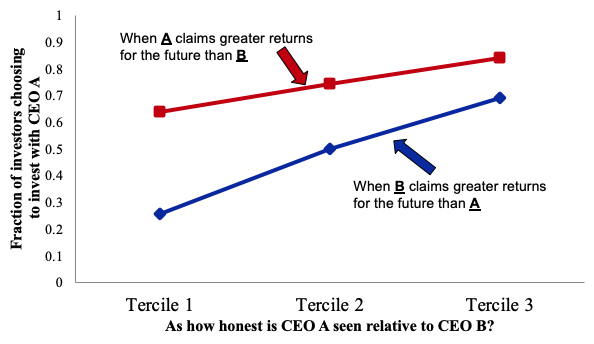 Further, the more a CEO was perceived to treat honesty as a protected value, the less investors tended to be sensitive to the relatively higher future returns claimed by CEOs perceived to be less honest. These results are illustrated in Figure 1. Third, there is important variation in how investors regard ethical decisions, and these differences have a substantial impact on investment choices. Specifically, some investors are ‘pro-self’, trying to maximise their investment returns. Others are ‘pro-social’, which in this context means that they also care about ethical goals other than their own returns. Pro-self investors optimise their risk-return profile. They seek higher returns as well as lower uncertainty about claimed returns, and they trade off the two factors against each other. In other words, to them, managerial honesty is important because it mitigates deception risk. The rationale at work here is that CEOs with strong perceived commitment to truthful reporting are expected to announce more reliable information regarding investment returns. Pro­social investors, by contrast, seem to base their investment decisions directly on moral values and are largely insensitive to financial returns. They prefer to invest with the non-earnings management-oriented CEO when they themselves have strong protected values for honesty, or when he is perceived as the more honest CEO. The key implication of this line of research for financial institutions is that they should acknowledge the importance, to their clients, of managerial honesty. The ‘know your client’ mantra of wealth managers and banks too often considers only issues such as risk tolerance, experience and competence, and the financial goals of the investor. Occasionally, investors’ goals or preferences regarding environmental and social issues are considered. The present research suggests that this misses out on an important dimension of investor preferences, namely their broader ethical values and their concern for such values in individual CEOs. Applying these insights does not require banks or investors to have (hard or impossible to obtain) detailed data on the values of CEOs – what matters for investment decisions is the perception of investors. Transparent information regarding issues revealing managerial characteristics is required to enable investors to channel funds to firms they consider more honest. This is where policymakers and regulators have a key role to play in setting the right disclosure requirements – but it is also important for companies to recognise that managerial honesty can help lower their cost of capital. In sum, from an overall financial market perspective, managerial honesty may be an important factor that facilitates stock market participation for a variety of investor types. From a prudential perspective, observing that broad clienteles of investors’ elect to invest with firms managed by honest CEOs, though for different reasons, suggests that market discipline may contribute towards curbing managerial unethical behaviours after all. Although we still know too little about these issues, and although more research needs to be undertaken to make them concretely implementable, ultimately the consideration of managerial honesty will enhance the role that the financial sector can play in channelling investments where they are most effective. Authors’ note: This column builds on and updates an article that has appeared in the International Banker Magazine in 2017. Dyck, A, A Morse, and L Zingales (2014), “How pervasive is corporate fraud?”, working paper. Zingales, L (2015), “Presidential address: Does finance benefit society?”, The Journal of Finance, 70, 1327-1363. Egan, M, G Matvos, and A Seru (2017), “The market for financial adviser misconduct”, Journal of Political Economy, forthcoming. Gibson, R, M Sohn, C Tanner, and A F Wagner (2018), “Investing in managerial honesty”, CEPR Discussion Paper 13207.